Figure 1. 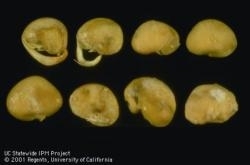 Bean seeds rotting fromPythium rot infestation. A grower recently called to ask about the minimum soil temperature for planting blackeye and large lima beans. The University of California, Division of Agriculture and Natural Resources has produced production manuals for both blackeyes and limas. A general guideline for blackeyes is to plant as soon as the weather warms and the soil temperature in the seed zone (about 2.5 inches deep) reaches at least 66°F for the three days following planting. Under these conditions, blackeyes will emerge about three to five days after planting. It is important to try to plant blackeyes early enough that they can set pods before the hottest temperatures of the summer. Planting when soil conditions are still cool, however, could result in a longer emergence time, around 10 days. This longer time to emergence means greater susceptibility to diseases, like Pythium or Rhizoctonia (Figure 1). Blackeyes can be grown on a range of soil types, both coarse and fine textured soils, provided that irrigation is adequately managed to keep the plants from being water-stressed or waterlogged. Blackeyes are moderately tolerant of salinity and can generally tolerate an average root zone salinity of 4.9 dS/m before yield declines are expected. Figure 2. Soil temperature effects on lima bean germination and emergence. Similarly, large limas should also be planted when soil conditions have warmed, and a general guideline is when soils have reached 70°F in the seed zone (about 3 inches deep). At these warmer soil temperatures, wireworms will recede deeper in the soil and present less of a problem, and emergence will be quicker and more uniform. 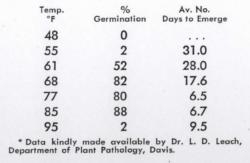 The effect of soil temperature on germination and days to emergence is shown in Figure 2. These data show that percent germination improved dramatically when soil temperature reached 68°F, but the average number of days to emergence was greatly shortened when the soil temperature reached 77°F. As with blackeyes, planting limas into warmer soil will help reduce fungal infection. Limas grow best in loamy soils. If grown on finer textured soils, irrigation must be properly managed to prevent waterlogging. Limas have low tolerance for saline soil conditions, and yield declines are expected when the average soil salinity reaches 1.5 dS/m. In addition to the production manuals previously mentioned, I also consulted UC production manuals produced in the 1950's, including Dry Edible Bean Production in California (1954), Blackeyes: Costs of Production, Suggestions on Growing (1956), and Production of Dry Edible Lima Beans in California (~1951).